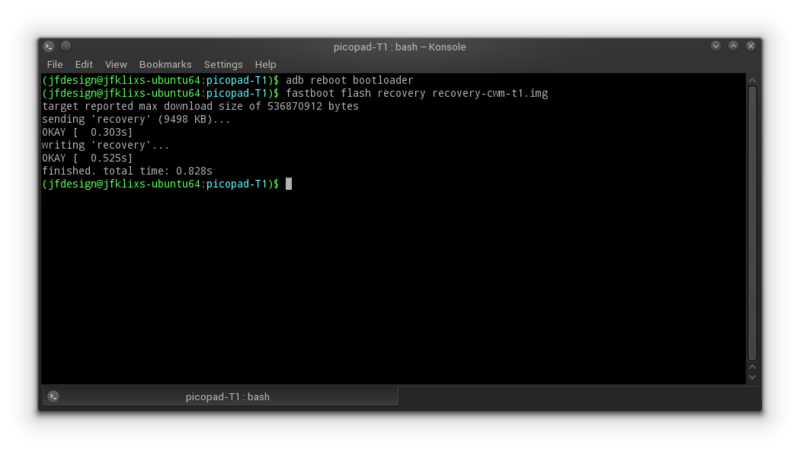 Here is the cwm recovery for Axioo Picopad T1 model. The T1 model is using Snapdragon 410 msm-8916 quadcore from Qualcomm, cortex a53 up to 1.4GHz, with Adreno 306 GPU and of course with 4G LTE data. You can root the device using this custom recovery and also playing with custom rom zip. it’s relatively small and easy to install on winblows os platform and you may ask for support on their xda thread when you face any difficulties. Copy the downloaded cwm from me on the same folder as adb and fastboot tool. There will be some output text underneath it, check for succesful text then you’re good. Pull out the usb cable from the device and turn off the device by pressing the power button for 10 seconds or more until it completely off. DO NOT let the device boot into the system or the cwm recovery will replaced again with the original recovery from qualcomm as part of their protection. From off position, you can enter the cwm recovery using key combination : Press Vol up and hold, press vol down and hold then press power button until the device vibrate and turned on. It will go directly to cwm recovery mode. After you arrive on cwm recovery mode, you may install root using chainfire supersu package or my custom rom for Picopad T1 immediately. After you flashing chainfire supersu or my custom rom, the scripts on the installer will disable auto restore recovery from qualcomm and the cwm will stick on the device forever. Here is the screenshot on my console command while I’m flashing this on my linux machine. Should be the same output even on winblows machine.